Have you heard of the Liebster Award? I hadn't, until Rose of Something Rose Made nominated me. The Liebster award is a blogger to blogger nomination (not limited to quilting) to help blogs get more followers, and I'm honored to get the nomination. Thank you Rose! I met Rose through the 2017 New Quilt Bloggers Blog Hop. It was a fun and exciting group where we shared tips and critiques about how to improve our quilting blogs, and of course, friendships were made in the process. Rose and I have followed each other since then, and she is one of the most encouraging people in my machine quilting journey! 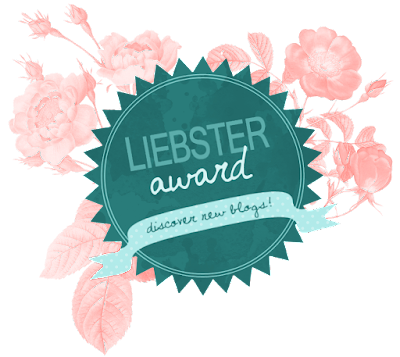 You can read her Liebster Award post here. According to the rules, I'm to include a short commentary of a blog I follow. Well, I follow a lot of blogs, but one of my favorites is Suzy Quilts. I don't remember how I found Suzy Quilts, but once I did, I didn't want to leave. Her blog is a joy to the eye, so clean and aesthetically pleasing, and she's got a beautiful, modern taste that I aspire to. She posts many great and useful tutorials as well as product comparisons. (She even has city guides for quilters, something I used the last time I went to Chicago!) And the cherry on top? I frequently find myself laughing out loud at her writing. She's so hilarious! If you aren't following her already, well, go see what you're missing! Who inspired you to quilt/sew? Actually ... nobody to start with! I started quilting because I ran out of knitting classes to take on Craftsy, so I decided to pursue a new hobby (so I can take more classes). Before I knew it, quilting caught my eye, and I haven't looked back. If you could meet one Quilt Personality, who would it be? Everybody who reads my blog knows how much I adore Angela Walters! She was and remains my #1 inspiration for machine quilting. But I'm signed up for 3 classes with her next year in QuiltCon, so barring any unforeseen circumstances, I'll meet her in February! I always prefer to have something going. I either blast alternative rock, or listen to audiobooks, or listen to TV reruns. It helps me through the not-so-fun parts (like preparing a backing) and when I'm on my longarm, having music going makes me more relaxed! Do you have a favorite snack/munch while quilting? I don't snack in my quilting area. Too risky. The most I will do is drink some water. Do you look for quilts while watching a movie? I usually see something I really want to make, and then look for fabric in my stash (or go shop for some more fabric) to fit it. What is your favorite quilt? I have made quite a few quilts now and I love them all, so I really can't pick a favorite. My more recent finishes are certainly better executed than what I did a year ago, but that doesn't necessarily mean I love them more. Hand Quilt or Machine Quilt? Machine quilt, all the way. If I had to hand quilt, I wouldn't be quilting. I joked to my mother-in-law that I'm allergic to sewing by hand ... but it's true! I have so many favorite colors! I love bright colors and metallics, and don't care much for pastels or earthy colors. My favorite color lately is probably a hot pink. My longarm, of course! I always feel a sense of great happiness when I walk into the quilting room and see her. I even love the way she smells. Do you work on one project or many? I usually have about 4-5 I'm working on simultaneously. Now, my nominees! Actually, make that nominee. I had in mind several people I wanted to nominate, but they've all been nominated already or had too many followers to qualify. But I managed to grab Sherry of Powered by Quilting up before others did! I met Sherry through the 2017 New Quilters Blog Hop, and we bonded over the fact that we both have an engineering background! (She's a current engineer, and I'm a retired engineer.) Sherry's got great tutorials and many beautiful quilts on her blog. Please go visit her! For Sherry, I'm passing Rose's questions along. I think they're great questions! Thanks for the nomination!!! :) Also we totally should meet up at QuiltCon! :) I loved reading and learning more about you! Your work is so beautiful! Great post Liz! I'm glad you joined. And yes, I knew what your response was going to be on the Quilt Personality question. Keep up your amazing work and I hope you find your robot butler. Great post Liz! I am looking forward to Sherry's post as well! I enjoy reading your posts and seeing the progress you're making on your quilts. Loved your entry and such a fun little award! It is true that folks got snapped up pretty quick in our 2017 NQBloggers world - a good thing. Congratulations on your award, it's lovely to get to know you better. Lots of luck on your quilting and blogging journey, you are doing great.